A recurring event, where recruiters can chat with candidates during office hours. Direct candidates to the landing page URL to connect via one-on-one chat. This is an ongoing event where you can chat with candidates on their time. Keep a chat tab open while you multi-task throughout your day! Review chat conversations, take notes on candidates, email follow ups, or move them to your ATS. TARGETED EVENT TYPESVirtual Open House is a versatile platform that allows you to create and host many different types of events. Here are a few highly effective event types used by our clients. An event hosted by a group of recruiters to give candidates access to information about the company and learn more about open positions. An initiative specific event hosted by a group of recruiters to connect with candidates. An internal event hosted by a group of recruiters or employees to improve retention with mentorship, networking, and internal mobility opportunities. An event hosted by a recruiter the day before an in-person interview where candidates are provided with tips and suggestions to help their chances during the in-person interview. Ready to Get Started?Let us walk you through the entire platform and show you all that Virtual Open House has to offer. 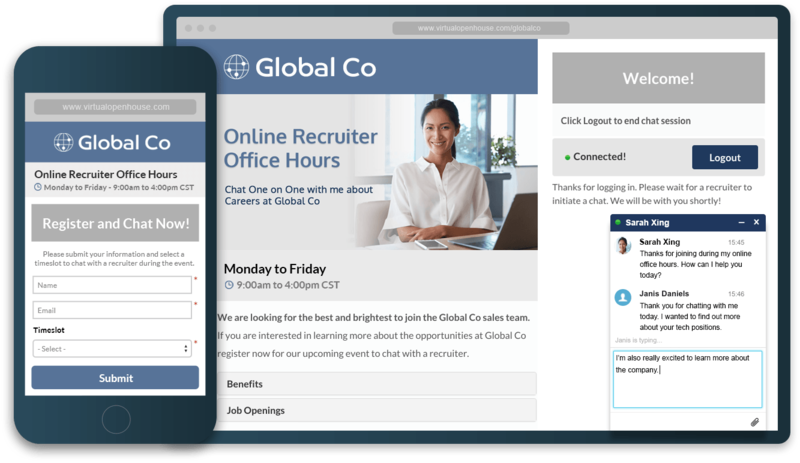 Our recruitment software helps your recruiters connect with job candidates before your competition, and it gives candidates an opportunity to chat with your team and learn more about your organization through a unique and memorable experience. Copyright © 2018 Virtual Open House. All rights reserved.